Will you help me? I received some really negative news a number of years ago around my birthday. Because of the timing, I was reminded every year when my special day rolled around. In an effort to break that cycle, I decided to try and make my birthday stand for something positive instead. 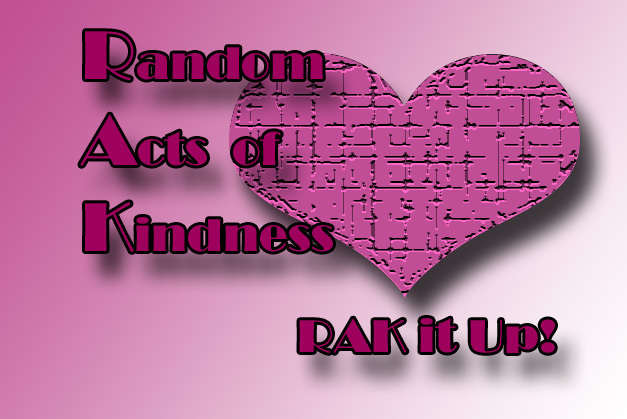 That’s when the idea of “Random Act of Kindness” (RAK it Up!) was born! What would if we were to start sending our waves of joy into the world by performing simple acts of kindness for one another? What if you were able to reach out and touch someone who is hurting and offer a moment of joy or hope? This year it’s time to go big! What would happen if we started a wave of kindness in our communities this holiday season? I challenge you to share this event with all your friends! Get your kids involved! If people ask why you’re doing this, tell them it’s a random act of kindness and ask them to pass it along! Give back in gratitude for the many blessings you have. I promise, you’ll be better off for it! Post and let us know what you did! Your idea might inspire someone else! And thanks for helping me celebrate my day in a positive way! RAK it Up! Join us on Facebook: https://www.facebook.com/events/195149570566610/ Please feel free to share this with your friends! “Here is a simple, rule-of-thumb guide for behavior: Ask yourself what you want people to do for you, then grab the initiative and do it for them” (Matthew 7:12a MSG).